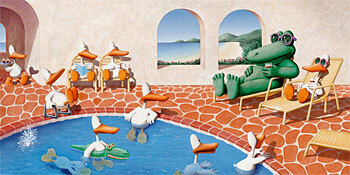 This neo-classic image of West Coast lifestyle was created by renowned artist Michael Bedard. Inspired by the bright and optimistic world of illustrators, he has been creating a series of whimsical and allegorical fine art editions since 1977. In the early eighties, Bedard was looking for a way to express a broad range of feelings about the human condition and wanted to use humor as a vehicle for addressing very serious issues such as vulnerability, alienation and anxiety, as well as social and political observations. Bedard chose the duck because it symbolized the vulnerability and attitude that comprises the human psyche…read more about Michael Bedard.